The first weekend of the beach volleyball season has concluded with a number of top-20 matchups taking place. 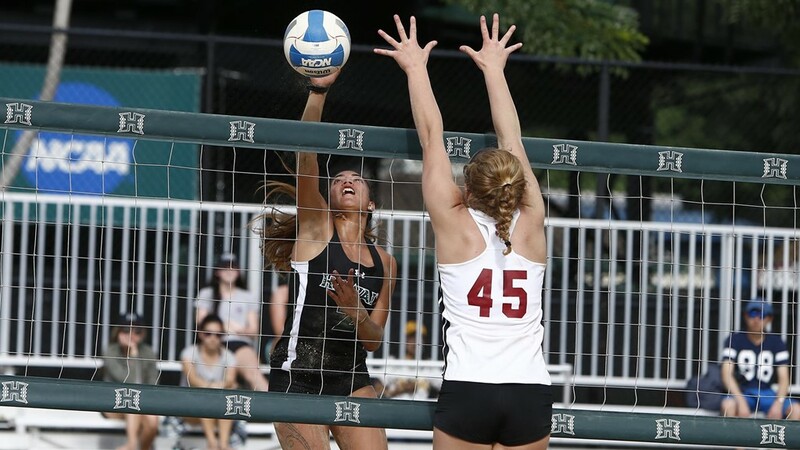 One big event that took place this weekend was the Rainbow Wahine Classic in Hawaii. This tournament featured #3 UCLA, #5 Hawaii and #17 Stanford. UCLA and Hawaii escaped the weekend with 3-1 records while Stanford ended with a 0-4 mark. In the #2 spot for Hawaii, Ka’iwi Schucht and Emily Maglio was the only pairing to post a perfect 4-0 mark on the weekend. The duo also only had to extend one match past a sweep, as they defeated Stanford’s Morgan Hentz/Amelia Smith in three. Day one of the competition was a day of one-sided successes with the match results coming out to 5-0 or 4-1 victories. The second day of the tournament saw all three matches come down to the final victory of the day to decide a winner. UCLA picked up the first tight win of the weekend as they relied on Nicole McNamara and Megan McNamara in the #1 spot to take down Hawaii’s Carly Kan/Laurel Weaver in straight sets to take the 3-2 win. Next up was Hawaii who clinched a win with Schucht/Maglio securing the win over Stanford at the #2 slot. UCLA took the 3-2 win over Stanford to conclude the tournament with wins from their #5, #3 and #2 spots.